A can of Ramon Pena mussels. Saltie Girl specializes in tinned seafood. When we got the call we high-fived. Clinked glasses. Broke into an embarrassing race-walk from the bar where we’d been nursing drinks for an hour. A table, one of only four, had opened up at no-reservations Saltie Girl and no way were we going to lose it. The final obstacle, a steep flight of stairs, felt like no obstacle at all. It’s possible we leapt from street to second floor, so excited were we for the meal that lay ahead. And so we arrived, standing ravenous before an altar of gleaming tinned fish. This surprisingly intimate spot, like a sloop’s galley, sits on the second floor of a Dartmouth Street brownstone. Its nautical theme feels fresh. Lush turquoise tiles, fish scale-shaped, stream beneath the 11-seat bar. Beams are lashed in rope. Bright white stools and floor may trick you into thinking the sun’s out. Two ship figureheads dangle provocatively behind the bar — sister mermaids — sealing the sensation you’ve entered a beachy, yacht club dreamscape. 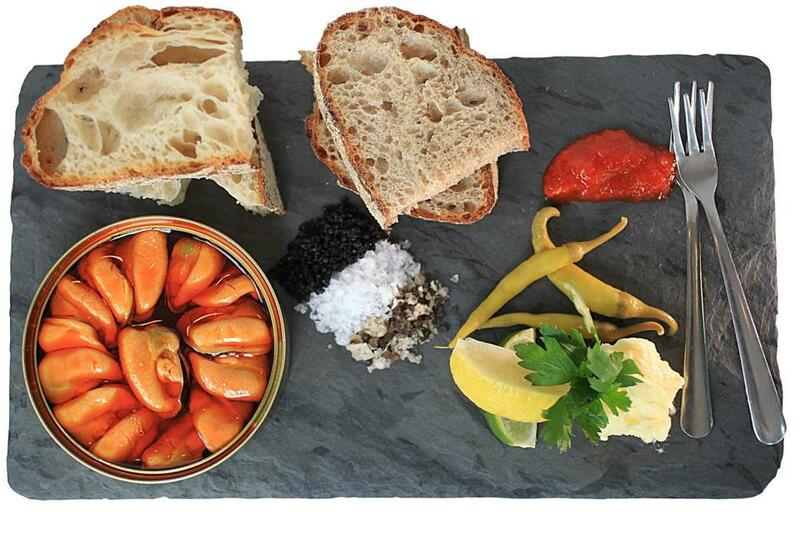 Saltie Girl surfs a dining trend, one where an array of high-quality tinned seafood and fish are offered as tapas or small plates alongside freshly caught fare. The inspiration for owner Kathy Sidell traces to a legendary tapas bar in Barcelona, Quimet y Quimet, but more recent versions have popped up in New York, Seattle, Minneapolis, Portland, Ore. — and locally, too, at places like Haley.Henry. You’re greeted so earnestly that any awkwardness at the door melts away. When these tins hit the table, it can feel like mockery — are we really cutting into a can of mackerel while gripping a cloth napkin? But their delicacy is hard to deny. This is dangerous (read: expensive) temptation. Gorgeous Ramon Pena mussels — fanned delicately in a round can — are tremendously tasty, and priced to make one shudder ($28). Both nights I ate at Saltie Girl, helmed by chef Kyle McClelland, the food was unassailably excellent. Every person I ate with loved every dish. Still, there was round agreement that Saltie Girl has issues. They may be minor — glitches and hiccups — but a hard and fast corrective has the potential to make a very good restaurant into a great one. Most prominently, servers advise you that the chef likes to send out dishes “shotgun.” You hope this translates to the chef’s establishing a rhythm, staggered, playing texture and flavor to maximum effect. Considering how many modes the menu attempts — raw offerings, New York-style smoked fish, small plates, large plates, sandwiches, toasts, fried shellfish, sides — and how many compass points it touches, a magisterial hand would seem compulsory. During our first visit, “shotgun” felt more like chef-hellbent-on-wrapping-up-the-night. Within minutes, our table was the sight of a disorienting seven-dish pileup. We’d barely dug into our Point Judith calamari — expertly fried and containing delectable surprises (crispy chorizo and piquillo peppers) — when we were slammed with a stream of small dishes. 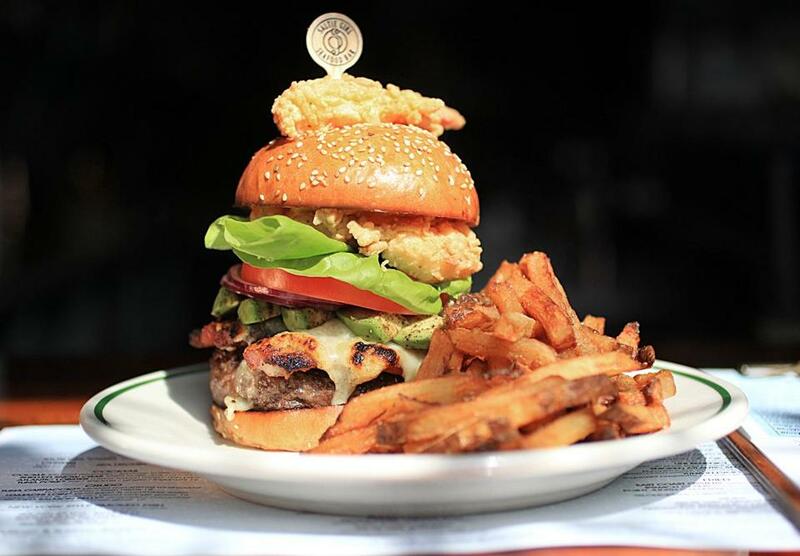 Saltie Girl burger piled high with Gruyere, avocado, fried lobster, and pork belly. No problem. But deluge us with a hot buttered lobster roll and the insane Saltie Girl burger, piled with Gruyere, avocado, fried lobster, and pork belly, and suddenly we are playing frantic gastro-Whack-A-Mole. A bite here, a bite there, this was getting cold, and why on earth were we plowing through a mammoth burger as we tried to saw apart a lobster roll with the steak knife our server handed us when we could have been lingering over this delicate scallop ceviche or that sublime hamachi loin bathed in pineapple, cucumber water, and shiso oil? Thing is, everything is so scary tasty, we ate and enjoyed and swallowed the entire mismanaged experience. Saltie Girl’s toasts sound innocuous. Yet the garlic clam toast with bacon jam and Fresno chiles was magnificent: bright and powerful and layered with complexity. And the same went for the snow crab (with avocado, pistachios, stracciatella) and uni Benedict toasts (with sunny-side-up quail eggs and hollandaise on brioche). Powerhouses all. 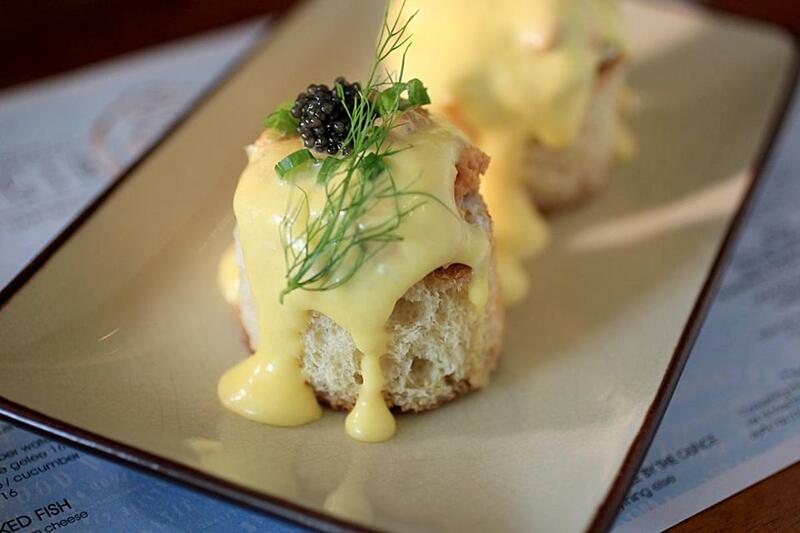 Uni Benedict toasts with sunny-side-up quail eggs and hollandaise. The salads, which I expected to be throwaways in such an ocean-oriented setting, easily held their own. The Boston lettuce salad, dressed tartly with champagne vinaigrette and layered with shaved vegetables that tasted earthy and local, acted as the perfect foil to brakes-off fare like fried lobster over butter-laden waffles. And if the heirloom tomato medley hit familiar, if deeply satisfying, notes, it was made new via toasted amaranth and quinoa. The drinks menu at Saltie Girl is mostly a stumble. Gin with watermelon, basil, and lime sounded a crafty, late-summer chord, yet both peach and pineapple concoctions tasted barely of liquor, mostly of juice, came ice-packed, and disappeared fast. The many by-the-glass wines are better partners for this food. Our tinned mussels and anchovies arrived last. Or so we thought. Saltie Girl offers no coffee service or dessert, so we were prepared to treat the tins as the finale, which seemed fitting. Laid across buttered bread and sprinkled with sea salt, they hit a transcendent note. Palates sated, we awaited the check. But then a straggler landed — the tuna poke — and with a thud. It was impossible not to eat. On its own, I might have ordered another. Yet the heavy soy and sesame marinade crushed the sweet lingering traces of those precious cans. On my second visit, I control-released the order over two hours like an IV drip, supplying balance and structure and a through-line of pleasure. Every dish got its leisurely, brilliant due. This time we ended on three clam spaghetti, latest contender for top 10 desserts of my life. 281 Dartmouth St., Back Bay, 617-267-0691, www.saltiegirl.com. All major credit cards accepted. Wheelchair accessible. 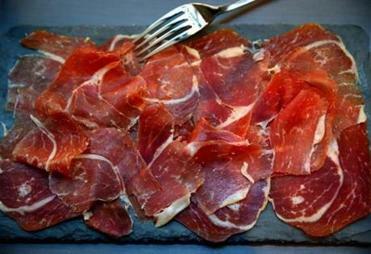 PRICES Small plates, crudo, fried seafood, and toasts $9-$22. Large plates and smoked fish $16-$65. Ted Weesner can be reached at tedweesner@gmail.com.